Having not played any deck building games before I wasn’t really sure what to expect from this game, in fact I felt a little sceptical about whether I’d enjoy it or not. My only experience with deck building games has come from video games like Hearthstone and Gwent – with the former not really clicking for me, but loving the latter. In Ascension: Realms Unraveled your aim is to acquire the most honour and you can do this by buying heroes and constructs or by defeating monsters. Setup for the game is easy, split the Heavy Infantry, Mystics and Cultist cards and place them on the board where specified. Then shuffle the main centre deck and place them face down on the board and deal 6 cards face up in to the centre row. Also set aside 30 honour per player in the Honour Pool, so if you have 4 players you will use 120 honour. Each player starts the game with 10 cards consisting of eight Apprentices and two Militia. Apprentices give you Runes when played which you can spend to recruit Heroes or Construct cards. Militias provide with Power, which is used to defeat Monsters. Honour is gained both by collecting Hero and Construct cards and defeating Monsters. The game revolves around the Centre Deck that contains Heroes, Constructs, and Monsters. 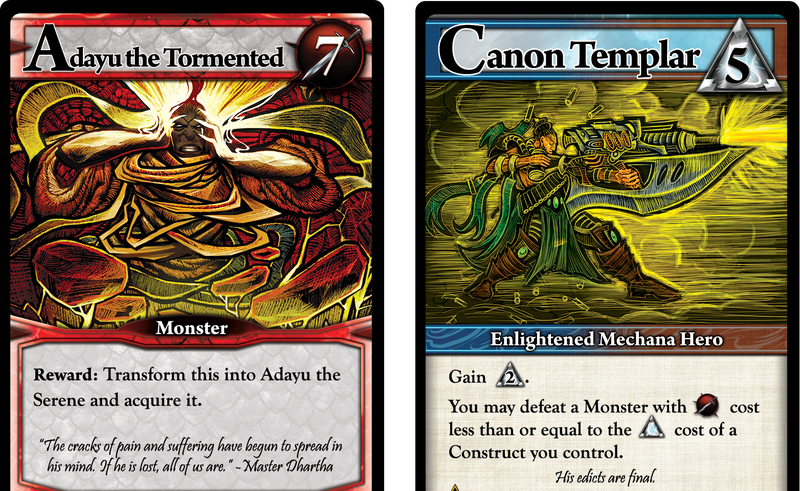 Players take turns ‘buying’ Heroes or Constructs for their decks, or defeating Monsters for Honour and other bonuses. Whenever a card leaves the Centre Row, you immediately replace it with a card from the Centre Deck. Players also have access to two Heroes, the previously mentioned Mystics and Heavy Infantry – these cards act as upgrades to you starting cards. Finally, players can spend 2 Power at any time to defeat a Cultist, which will grant them 1 Honour. There are a number of different bonuses and rewards from cards; some give you more Runes or Power to spend, some give you a one off rewards like a handful of Honour, whilst others let you banish cards permanently from the game, these cards are great for trying to rid yourself of the starting cards which will quickly become a little redundant or under powered for what you’re trying to achieve. 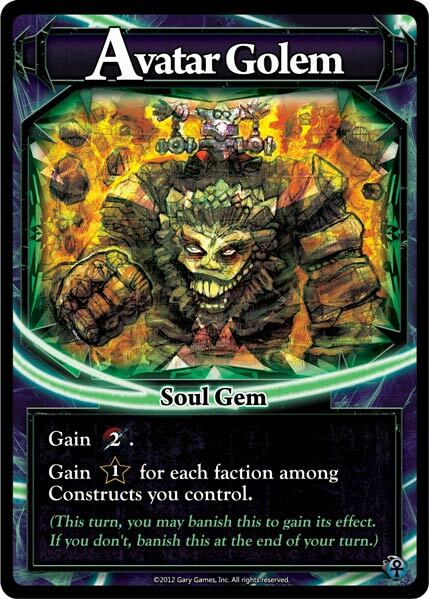 Cards can also be aligned to factions in the game; essentially these can provide you with bonuses if you draw multiple cards of the same faction on your turn – called ‘Multi-Unite’. Each faction generally caters towards helping you with one aspect – i.e. The Void faction usually helps with killing monsters. This gives you the opportunity for a lot of tactical plays and allows for some fairly deep strategies, although part of this does depend on the randomly drawing cards, so you might need a bit of luck. But with such a large deck and such variety in the cards, you will be able to find something that works to your advantage. You also have an ability to transform cards when certain criteria are met; this means they become a slightly better version of the card – usually worth more Honour, with a different ability on offer. A typical round will consist of a player dealing 5 cards to themselves from their deck and using them as they see fit to acquire new cards or defeat monsters etc… Any cards spent or acquired go in to a discard pile. At the end of your turn you will then deal five more cards from your deck to use on your next turn. If you run out of cards in your deck shuffle your discard pile and draw from that. Once the pool of Honour is depleted the game ends and it’s time to count up how much you have, the person with the most Honour, unsurprisingly, wins. I was pleasantly surprised by the amount of depth and strategy on offer in the game and the more I played and the more I understood the benefits of the cards, the further in advance I would try to plan and the deeper my tactics would become. With the first few rounds I was a little unsure about what I was doing in terms of any overall strategy but as time went on I started to really enjoy planning my next moves and everyone was getting very engrossed in building their own ‘perfect’ deck to win. The pacing of the game felt quite slow to begin with, but we put it down to being new and trying to figure out rules and strategies, but as you progress through the rounds and you start to build a more competitive deck you can quickly start to ramp up your Honour pool. The overall quality of the game is great too; the art design on the cards is bold, striking and good quality. The placement for the Honour is a little odd and basically just ends up spilling out on to the table. I’m also not really sure why the Cultist card even exists seeing as there is only one and it’s never removed from the game, it may as well be printed on to the board… But it’s not exactly a problem. Overall everything is made to a good standard. 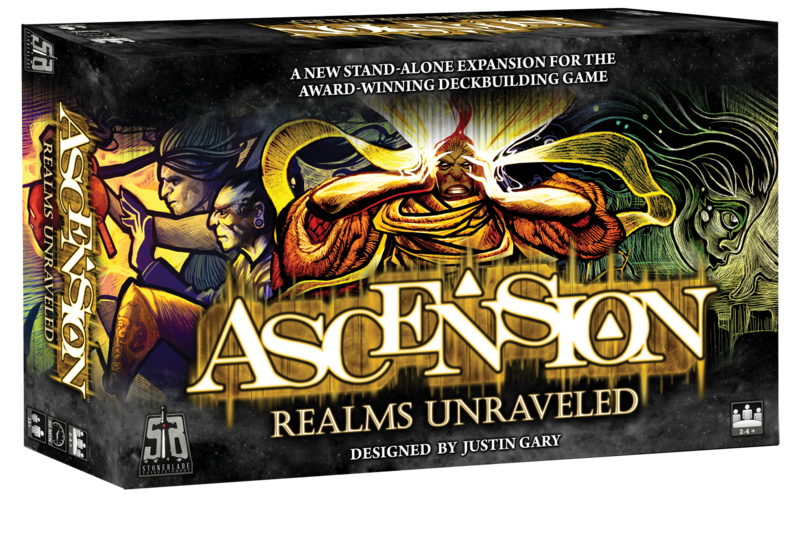 Ascension: Realms Unraveled may have been my first foray in to deck building games, but it certainly won’t be my last. The simple setup and depth of deck building makes the game very engaging and playable. There are also solo and team variants of the game that can be played – although I haven’t tried these yet, but it’s nice to see that there is variety with how many can play. 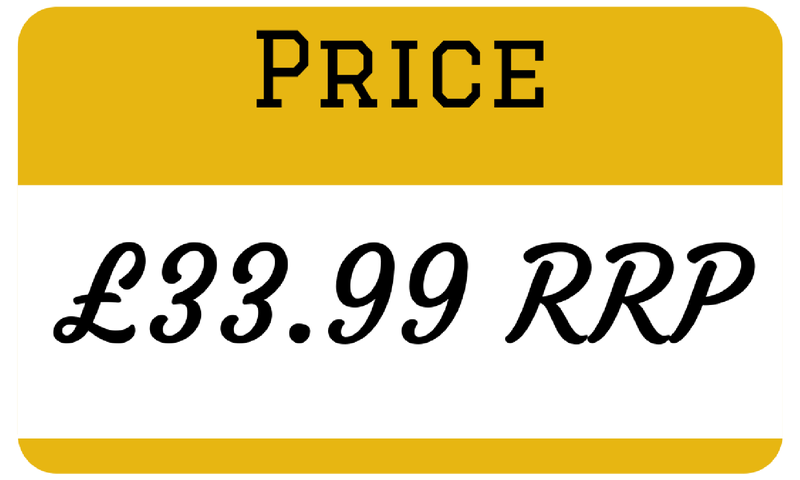 Track down your copy of Ascension: Realms Unraveled here.